With the NCAA Tournament just hours away, we continue our breakdown of the entire field. 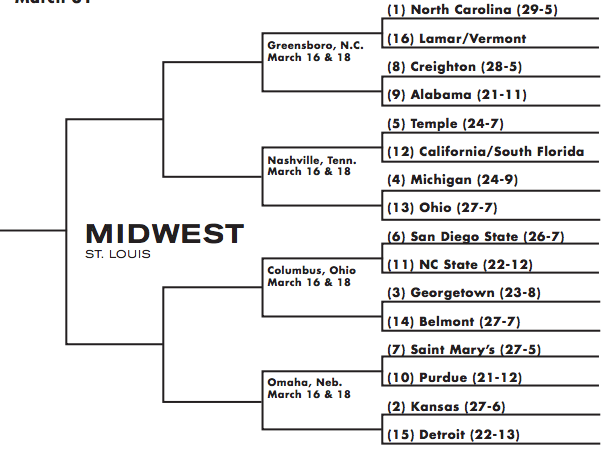 After looking at the South, West, and East regions in the last two days, we’ll take a look at the Midwest region, where UNC and Kansas look to be on a collision course in St. Louis. There are quite a few to pick from here. Assuming Cal takes down South Florida, Cal and Temple should be a hell of a 5/12 matchup. NC State and San Diego State should also be pretty interesting. But a 3-seed has only lost to 14-seed 15 times in the history of the tournament – and this might be the year to add another game to that list. Belmont is dangerous, dangerous team. Duke fans know this first hand, as the Bruins took the Devils all the way down to the final minutes in Cameron in the first game of the 2011-2012 season. Belmont loves to play fast, and they put up a ton of points -averaging just over 81 points a game while making almost 9 three’s each time out. Georgetown, in contrast, plays much, much slower, using their trio of big men – Hollis Thompson, Otto Porter, and Henry Sims to dominate the paint. They also have a history of completely flaming out in the tournament. This should be a fun matchup, and Belmont has all the tools – experience, ability to make shots, and fearlessness – to take down the big boys. We like Belmont a lot, but for variety’s sake, we’ll go with the Pack as our dark horse in this region. Yes, they’ve had some struggles but have come on very strong at the end of the season. They brought it against Carolina in the ACC Tournament, and they clearly have the potential to be a very, very good team – especially when CJ Leslie has got his head in the game. We’re not really sure how deep they will go, mainly because they’ve struggled with consistency all year, but if they play with the fire they had in Atlanta last week, the rest of the region should watch out. Ray McCallum is an absolute stud at the point guard position. He was a heavily recruited McDonald’s All American – one of a trio of point guards, including Brandon Knight and Kyrie Irving, sought after by Duke in the Class of 2010. Instead of heading to Duke, UCLA, Kansas, or any of the other bevy of high majors going after him, he chose instead to head to Detroit to play for his father. Leader of the Horizon League tournament champions, McCallum averaged 23.0 points on 63% shooting during the first leg of postseason play. If Detroit has any chance at being a Cinderella this season, it will all depend on Ray McCallum. 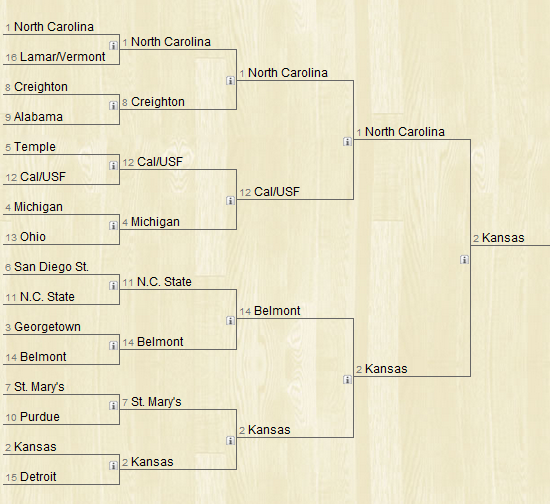 After three regions of mostly chalk, we’ve finally got some upsets brewing in the Midwest. #12 California should win its First Four game against #12 South Florida, and make a run at the Sweet Sixteen by taking down #5 Temple and #4 Michigan. The bottom half of the bracket will also be dominated by a few double-digit seeds, with #11 NC State and #14 Belmont advancing, with Belmont taking down the Pack and heading to the Sweet Sixteen. Meanwhile, both UNC and Kansas should dominate their relatively weak draws and meet in the Elite Eight. It will all depend on which version of Tyshawn Taylor shows up, but if he can be steady and cut down on turnovers, the Jayhawks should be able to book their tickets to New Orleans.